Built for Speed and Precision. Tactical Series™ Red Dots. The most reliable, rugged red dots you'll find when looking for speed and accuracy in a sight for your tactical fire arm. Whether you are putting this on an AR flat top, shotgun or pistol, the Tactical Series Red Dots are the answer. M-Pulse TRD2001 For shotguns, rifles or pistols, this compact sight with 5 MOA red dot is fully waterproof and shockproof. The all aluminum red dot has a self-regulating brightness control. The supplied riser block positions the sight at optimum height on AR-15 flat tops. settings includes scope coversand tactical rings for proper mounting height on AR-15 flat tops. TRD0005 1x 24mm 30mm 5 MOA Matte 4.8 / 136 | 4.35 / 110 .5" in. TRD1X30 1x 30mm 30mm 5 MOA Matte 7.4 / 210 | 6.3 / 160 .5" in. TRD2001 - - 5 MOA Matte 2.7 / 76 | 1.8 / 46 .5" in. 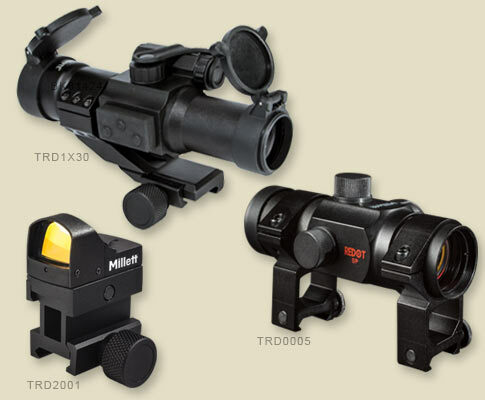 All accessories included with purchase of a Red Dot™ Sight.